Typically I do not care for the great amount of waste that accompanies food at the retail or restaurant level. That’s because I’m frugal (not meaning cheap, I want to use what I get). I have a greater problem with the amount of square tonnage of parsley wasted every year. Some eateries however prove to be the exception to the rule. For example this awesome BBQ Teriyaki chicken. Guess who didn’t get a tip? That’s right. I held back my green because the restaurant didn’t hold theirs. 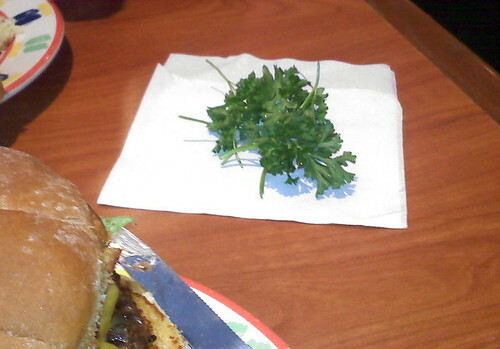 I asked the server not to include any garnish or parsley with our meals. They included it anyways. Look at that horrible waste. It isn’t like the parsley was taking up space on the plate that could have been occupied by real food as it was completely buried under my french fries and my wife’s salad. 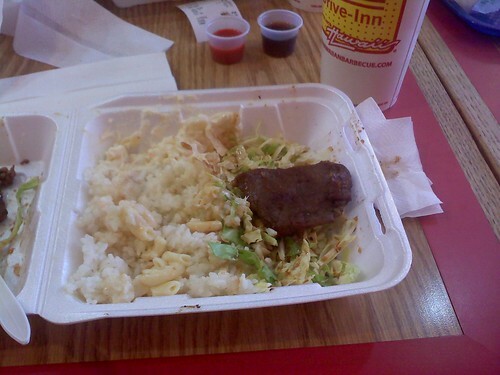 Yes, the house salad included a garnish that was found under the lettuce.